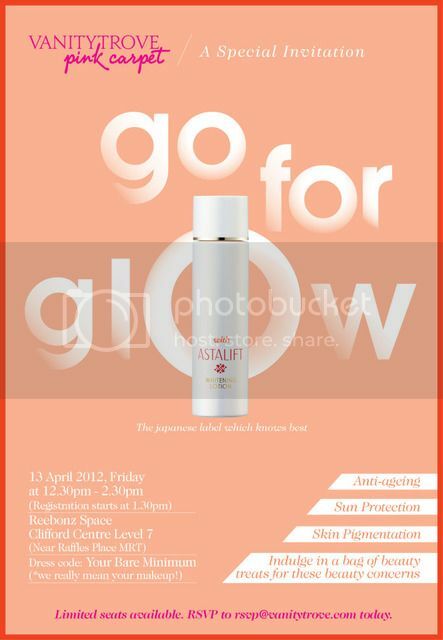 I was pretty stoked when the invitation to the "Go for Glow with Astalift" workshop landed in my mail box. 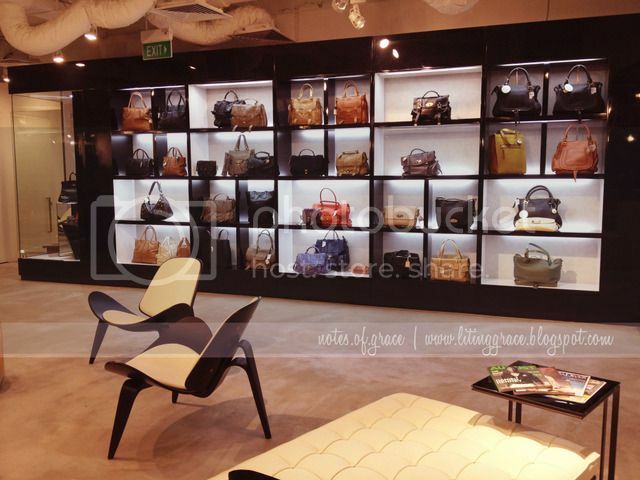 Thanks to the awesome peeps at Vanity Trove, I had the chance to attend my first ever beauty workshop on Friday the 13th at Reebonz. 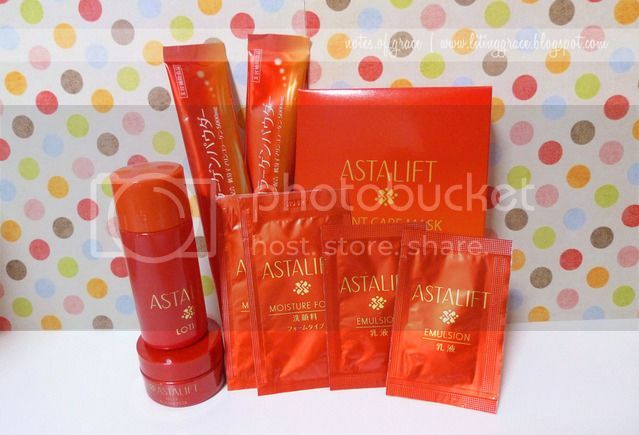 So what does Astalift means? ASTA in Japanese means “tomorrow” while LIFT refers to uplifting your inner emotions as beauty also comes from within. Here's an interesting fact about Astalift; it was created by Fujifilm. Yes, Fujifilm, the same brand that produces camera and film. I'm sure not everyone knows this, but Fujifilm has more than 80 years of knowledge in collagen. 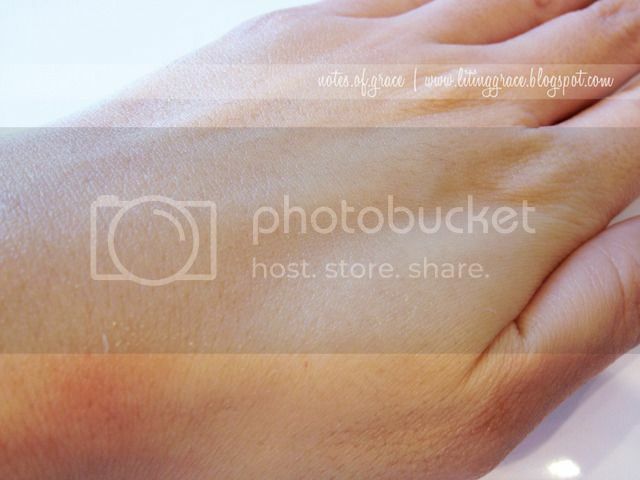 So how is photography related to collagen or even skin care? Skin ageing is caused by oxidation, a natural process which also causes photographs to fade. FUJIFILM’s advanced understanding of the process of oxidation allows it to apply its expertise to skincare products designed to combat the skin ageing and the onslaught of freckles and blemishes. The primary raw material of photographic film is made of collagen, which is also an important structural protein found in human skin. 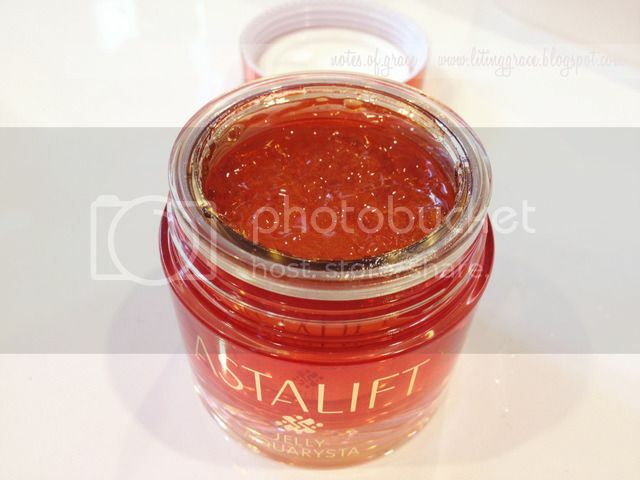 The technology of using collagen to hold together light-sensitive particles in photographic films is applied to the ASTALIFT range of beauty products created by the company. FUJIFILM also applied its proprietary knowledge of nano-technology – for exposing and colour developing in film – to allow high concentrations of nano-sized skin-nourishing ingredients to be delivered effectively and deeply in a targeted manner to different levels of the skin. Now that we know how two non-related field can come to together, let us know find out more about the distinctive technologies of Astalift. To combat the negative effects of oxidation on skin, a key ingredient – Astaxanthin – is added to all beauty products in ASTALIFT’s skincare series. It is also the main ingredient which gives ASTALIFT its natural red colour and lets its user enjoy the Power of Red (赤の力Aka no Chikara). Astaxanthin, the red pigment often found in carrots, salmon and prawns, contains powerful anti-oxidant properties. It has the natural ability to protect against damaging free radicals or reactive oxygen, and helps in maintaining skin elasticity and firmness. The major component of photo film is collagen. In the process of its long-established research on photographic film, FUJIFILM has successfully cultured collagen with the same amino-acid sequence as that in human skin. Research has shown that the combination of three different types of collagens of different sizes yields optimal skin penetration. ASTALIFT contains all three types of collagens that help to moisturise skin, enhance skin elasticity and replenish lost collagen for radiant, beautiful skin. 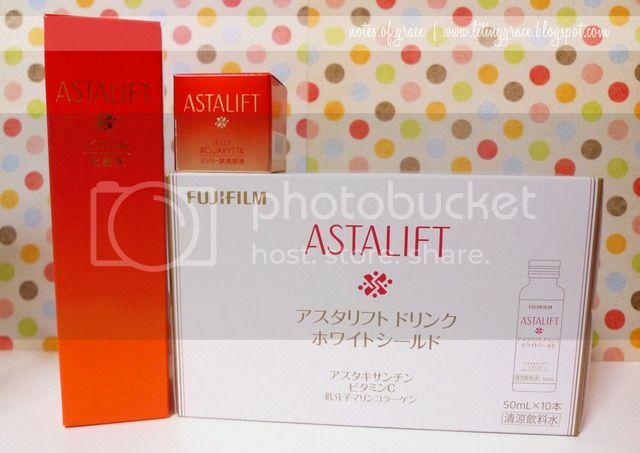 FUJIFILM applied its extensive knowledge on nanotechnology to allow the essence of Astaxanthin,and other skin-nourishing ingredients in ASTALIFT’ products, to penetrate deep into the different layers of the skin. These nano-sized Astaxanthin, combined with three different types of collagens, are absorbed quickly into the deeper layers of skin’s layers for optimal hydration and nourishment. One of the product that caught my eye was the award winning Jelly Aquarysta, which is a pre-lotion serum. Its unique name is derived from AQUA and CRYSTAL, which symbolises the light-as-water texture of the clear red jelly, and the crystal-clear, moisturised skin it brings. It's the first product in the range of products to deliver the active ingredients straight to the deeper layers of our skin quickly and efficiently with the use of Nanotechnology. 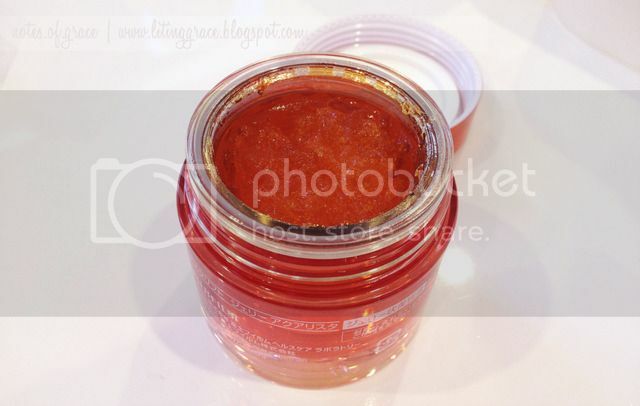 Here's a look at the Jelly Aquarysta when we stir it with a cotton bud. And here's how it looks like one minute later. You can see that it's starting to form back into the original state. Because of the unconventional use of a unique light-as-water jelly texture, with the absence of holding agents, such as oil, or an emulsifier, it produces a highly concentrated and stable blend of skin-loving nutrients to nourish our skin and help it brave the stormy effects of time. Here's a photo to show how well the product was absorbed into my skin. This being my first beauty workshop, I have to say that I learned a pretty good deal about the various technologies and I'm truly amazed at how these technologies can help our skin. The icing on the cake was when I was picked as the winner during the lucky draw. And here's what I walked away with: A full size lotion, 15gram Jelly Aquarysta and a box of 50ml x 6 bottles of White Shield drinks! 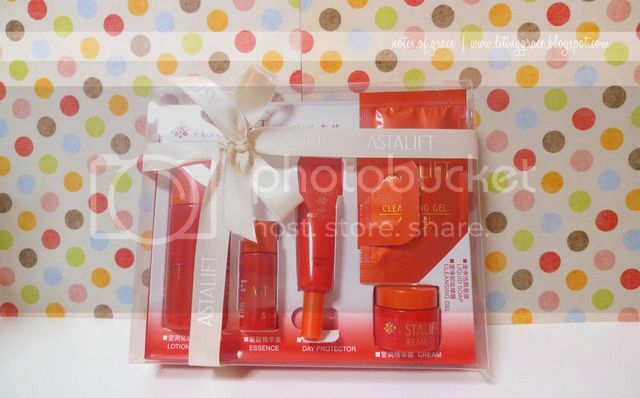 On top of that, all participants got to walk away with a goodie bag of Astalift's products as well. 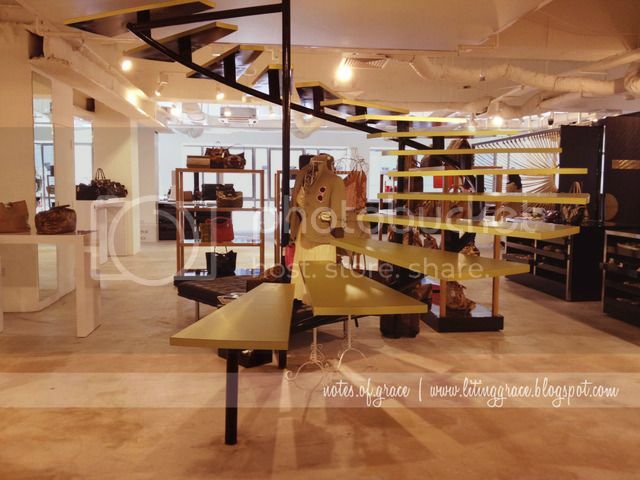 And here's some photos of Reebonz Space to end this post.